It’s time for the final interview round-up for season three! Below are excerpts from new interviews with Caitronia Balfe, Sam Heughan, Lotte Verbeek, executive producers Maril Davis and Ronald D. Moore, and composer Bear McCreary. Be sure to click on the links to read the full interviews. Since these posts/interviews follow the latest episode, beware of spoilers for the current episode and future seasons. DEADLINE: Talking of working out, back at Comic-Con this summer, you told me that you saw this year very much as a transitional season for Outlander. With the action-packed and storm-swept finale, did it succeed in that role for you? MOORE: Oh yeah, I think it definitely succeeded in the transition. I think when you watch Season 3 overall you have a sense of travel and journey, and that you’re not going back. Whereas, you know, say in Season 2 when the show went to Paris, but then midway through the season, you return to Scotland. You’re returning to that cast of characters and familiar locations like Lallybroch and so on, and you just felt a sense [that] Paris was sort of a little side trip, and now we’re back and this is really what the show is. In Season 3, they go across the ocean and then they’re swept to the shores of Georgia at the end. Even though we don’t state it explicitly, I think that overall you feel like something fundamental has changed in the show. As I said, the show isn’t going to return to the Scottish castles and it’s not really going to be that series anymore. So I think that was a big shift and I think we did do that successfully. ENTERTAINMENT WEEKLY: Let’s start with those underwater scenes. How did you shoot those? Did you have to hold your breath forever? CAITRIONA BALFE: We had this really cool water tank at the back of the Cape Town Studios in South Africa. Sam and I had done some underwater scuba training so we could stay underwater, and they would just come and feed us oxygen every 30, 40 seconds. SAM HEUGHAN: She was very good at that. She was like a mermaid. She has done scuba diving before. I’ve never done it. BALFE: It was fun. Things like that are always really exciting, and to sort of learn something new … It was quite cool until Sam rammed my face into a big chunk of wood. After such a challenging season apart, can you talk about the importance of that final sweeping scene on the beach? Sam Heughan: We love that scene. It was a really nice way to end it. They’ve been through so much and they were completely reduced to nothing. So that drone shot across the beach sets us up for the new world. Caitriona Balfe: They’re finally in America. It’s that beautiful, hopeful note that we needed and leave it on. Where did you film that? Balfe: It wasn’t America. That was actually South Africa. We filmed that in June. Heughan: It was a location we used quite a bit. We just had these incredible beaches. It was a protected site, and that same beach we had been working on when there were dolphins playing in the ocean right next to us while shooting. That was pretty amazing. You don’t get dolphins in Scotland, certainly not where we shoot. They were welcoming in season four. Mashable: ‘Outlander’ Season 4 preview: Will America be Claire and Jamie’s new home? Heughan says that for Jamie, it’s less about where he is, and more about who he’s with — especially after discovering that there are survivors from the shipwrecked Artemis, which hopefully means that Young Ian, Fergus and Marsali are also safe. 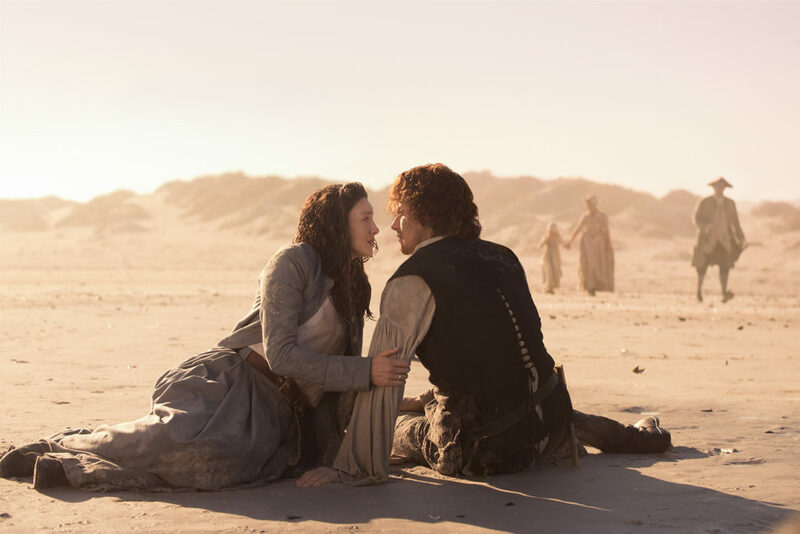 And while the happy couple’s moment of realization about where in the world they are is fairly brief, composer Bear McCreary tells Mashable that he found a fitting way to preview Claire and Jamie’s Season 4 journey in the closing credits, as you may have noticed. What were your thoughts when you first read that cave scene? What was your reaction? I really liked the idea of being murdered by Claire, my frenemy. I thought it was really good. I didn’t know where we were going to be shooting and it turned out that we built the whole cave structure in the studio. So we were there for a day. The scene has so many elements with the water and the fight between Hercules and Jamie. I think we did a good job — I hope. How did you prepare? How did you slip into playing Geillis again? Well, we shot the previous episode before that final cave scene. I was already in Cape Town for a month or so, getting back into her skin. Obviously she’s now in her 50s and 60s, and so she’s a little different. She was overweight and now she’s skinny. We made changes through her hair and some prosthetics. I like the thought of her having been in the Caribbean for so long by herself, holding onto that hope, not knowing when the new Scottish king will rise, but also a little bit defeated. Not completely, of course, because she hasn’t given up, but also she’s growing weary. And so, I used that in the character. It was really cool to see where she went, what had become of her. This entry was posted in Bear McCreary, Caitriona Balfe, Interviews, Lotte Verbeek, Maril Davis, Ronald D. Moore, Sam Heughan and tagged Bear McCreary, Eye of the Storm, Interviews, Lotte Verbeek, Maril Davis, Ronald D. Moore, Sam Heughan, Season 3, Season Three by Stephanie Bertone. Bookmark the permalink.